A dirty secret about branding. Over the years, my team and I have worked with dozens of brands, and we’ve analyzed infinitely more. And if there’s anything I’ve learned from years of careful analysis, what separates a really amazing, dreamy, rockstar, enviable brand from a garden-variety brand isn’t the logo, typography or color palette, as much as we obviously love those things. It’s the details. It’s the execution that makes all the difference. We realized last fall that we didn’t have a good way to work with clients on upgrading and elevating their existing brands. 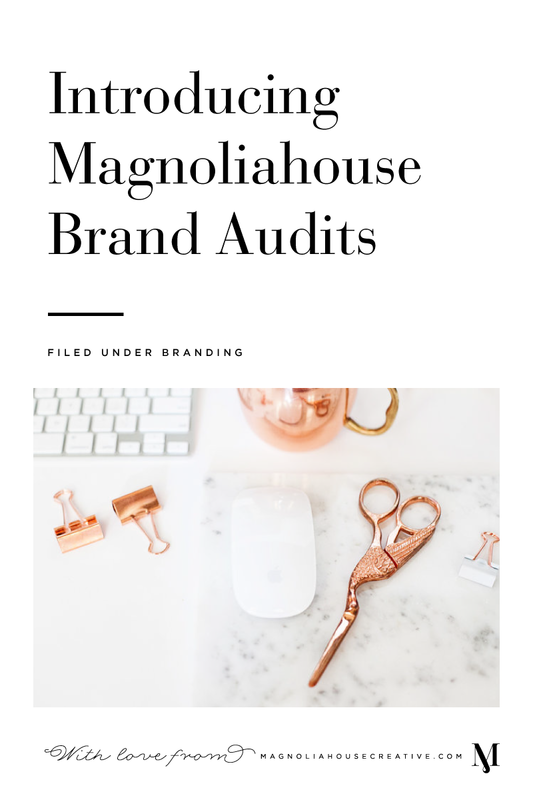 So, after lots of brainstorming and careful testing, we’re so excited to introduce the newest offering from Magnoliahouse: The Brand Audit. Sometimes, you’ve got a lot to work with, and you just need help putting the pieces together, cleaning up your online presence and optimizing what you already have. This is designed for entrepreneurs at an inflection point. You’re ready to take it to the next level, but you’re not sure where to start. It’s for that feeling when your brand and website start to feel a little itchy. Your business has evolved, and you’ve made changes to your website, created quick graphics here and there, and things don’t quite look as polished as when you finished working with your designer a while back. There’s a lot you still love about your brand, but you know it needs a little TLC. Or, maybe you’ve built your website from scratch, and you’d love to get a professional opinion and a second set of eyes on it. Something just doesn’t look quite right, but you’re not sure what it is, and you don’t have time to waste guessing what it is. You need to know now how to tweak your site into a sales machine that will help you make connections and convert your ideal clients. Girl, we’ve got you. We’ve designed this quick and painless process to help you work through these transition periods and truly elevate your brand, website & digital presence. Schedule your audit, choosing your preferred intensity – mild (I’m mostly happy with my brand, I just need a few pointers) or spicy (give me all you’ve got – I’m ready to make big changes). After you schedule your audit, you’ll receive a short questionnaire about your business and your goals. In addition to telling us all about your dream clients, you’ll also have a chance to upload any stationery or collateral pieces as well as any social media platforms you’d like us to review. On the morning of our scheduled review call, we’ll send you your completed audit PDF just in case you’d like to print it out for note taking. During our scheduled 60-minute review call we’ll cover every area of your brand and website, talk through our recommended action steps and answer any questions you may have. Ready to schedule your audit? ← Using details + execution to enhance your client experience.